Following the success of the R models for the Street Triple and Daytona 675, Triumph is introducing a premium version of its iconic Speed Triple, the Speed Triple R.
Working in close collaboration with Swedish suspension brand Öhlins, the Speed Triple R sports the latest specification NIX30 43mm forks at the front, with a jewel-like TTX36 unit at the rear. To minimize unsprung weight as much as possible, the lightweight five-spoke forged aluminum wheels from PVM are more than 3.7 lbs. lighter than those on the standard machine to deliver even more precise and agile handling. Stopping the Speed Triple R are top specification four-piston radial monoblock callipers from Brembo, the leading brand in MotoGP racing, with a switchable version of Triumph’s electronic anti-lock system available as an option. Together, the brakes and wheels offer a 5% increase in braking performance over the standard Speed Triple. 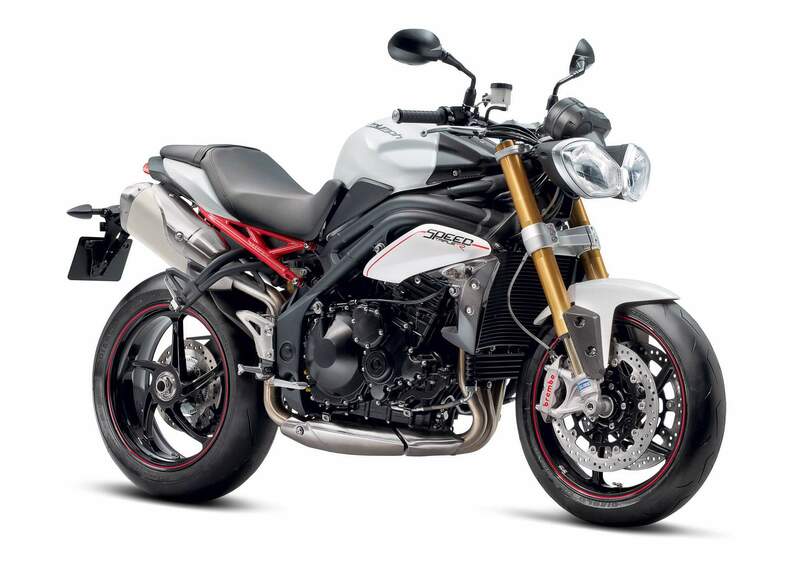 The Speed Triple R’s choice of metallic Phantom Black and Crystal White color options are complemented with red colored subframe and detailing, as well as the iconic gold forks, to create a sportier and more exotic look that confirms its status as Triumph’s premier naked sports model. Race-spec Öhlins suspension. Iconic 1050cc triple engine. New, smoother gearbox. Brembo monobloc brakes and lightweight forged alloy wheels from PVM. It’s the real deal. 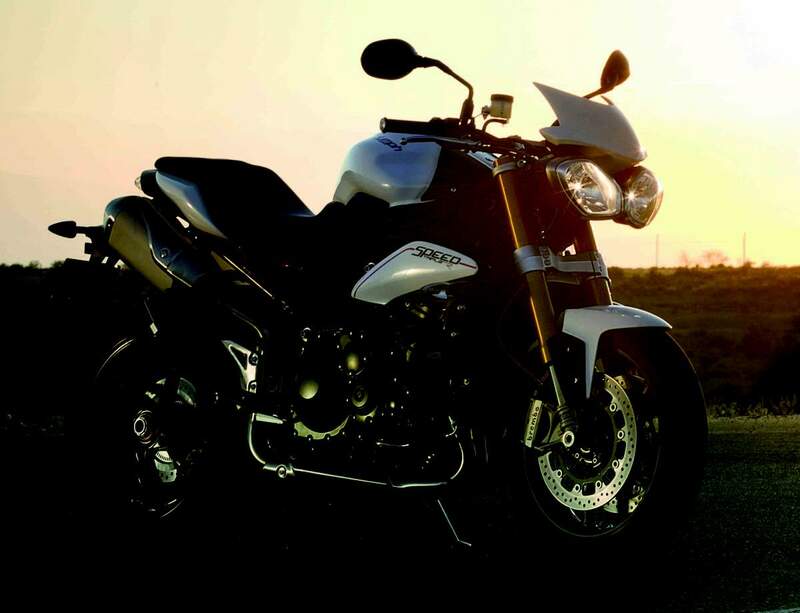 The essence of the Speed Triple honed, sharpened and distilled to the ultimate R grade. Razor sharp on road or track. An intravenous connection of man and machine, tyre and tarmac. Nothing comes close. From those iconic Öhlins NIX30 43mm front forks, developed especially for the new Speed Triple R, to the track-developed Pirelli Supercorsa SP rubber, it’s clear that this is no ordinary motorcycle. Looks a million dollars. Looks as good as it rides. Beautifully engineered forged aluminium wheels reduce unsprung weight by 2kg for scalpel like precision. Carbon fibre radiator and tank covers. Black anodized tapered handlebars. Jewel-like Öhlins TTX36 rear suspension for ultimate control and adjustability. Yours in black or white, with telltale red subframe for those in the know. It looks brilliant because it is brilliant. Triumph’s ultimate factory streetfighter. Triumph’s most iconic model receives the ‘R’ treatment for 2012, with a new model lavished with the most desirable components from the biggest names in the motorcycle industry. From the iconic Öhlins forks, developed especially for the new Speed Triple R, to the track-developed Pirelli Supercorsa SP rubber, it’s clear that this is no ordinary motorcycle. 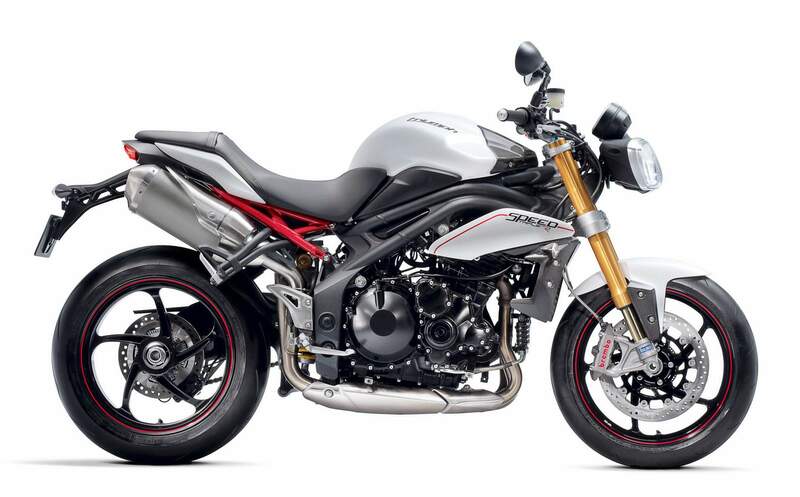 The Speed Triple R takes Triumph’s class leading roadster and creates a machine dripping with beautiful engineering and delivering a whole new level of poise and agility. Working in close collaboration with Swedish suspension wizards Öhlins, the Speed Triple R sports the latest specification NIX30 43mm forks at the front, with a jewel like TTX36 unit at the rear. To minimize unsprung weight as much as possible, the lightweight five-spoke forged aluminium wheels from PVM are over 1.7kg lighter than those on the standard machine, delivering even more precise and agile handling. Stopping the Speed Triple R are top specification four-piston radial mono-block callipers from Brembo, the leading brand in MotoGP racing, with Triumph’s switchable electronic anti-lock system accessed through the instruments. Together, the brakes and wheels offer a 5% increase in braking performance over the standard Speed Triple. Of course, every Triumph ‘R’ model comes with some added touches for that extra touch of quality. Paint options are classy metallic Phantom Black or Crystal White, with subtle details like the R branded tapered black alloy bars, carbon fiber radiator, mudguard and tank covers, unique decals and red coloured subframe making the Speed Triple R stand out discretely to those in the know. As you would expect, the Speed Triple R is highly specified with a comprehensive instrumentation package that includes programmable gear shift lights, digital speedometer, lap timer, fuel gauge and trip computer alongside the large analogue tachometer, with a coded key immobilizer is fitted as standard. A wide range of further options are available from Triumph’s Genuine Accessories range, including stylish fly screens, belly pans and seat cowls, security and luggage solutions. The accessory slip-on silencers and three-into-one ‘low boy’ exhaust, developed in collaboration with Arrow Special Parts for the Speed Triple, are also available for the Speed Triple R.
The Speed Triple R delivers the most intense and engaging ride of any Triumph roadster to date, a true iron fist wrapped up in a velvet glove. MotoGP-developed Öhlins suspension front and rear endows the Speed Triple R with outstanding composure and adjustability to suit a wide range of riding styles and road conditions. Looks fantastic too. Brembo monobloc callipers come straight from the racetrack and give maximum feel and performance, especially under extreme conditions, with 5% improved braking power over the standard Speed Triple. Switchable ABS available as an option. Five-spoke forged aluminium wheels from PVM are over 1.7kg lighter than those on the standard Speed Triple, endowing the R with excellent agility as well as sporting good looks. The Speed Triple R is dripping with special touches that make this bike stand out from the crowd. New R branded tapered black alloy bars, unique R graphics and the red subframe combine with the iconic gold suspension and monobloc brakes for a stunning new look.